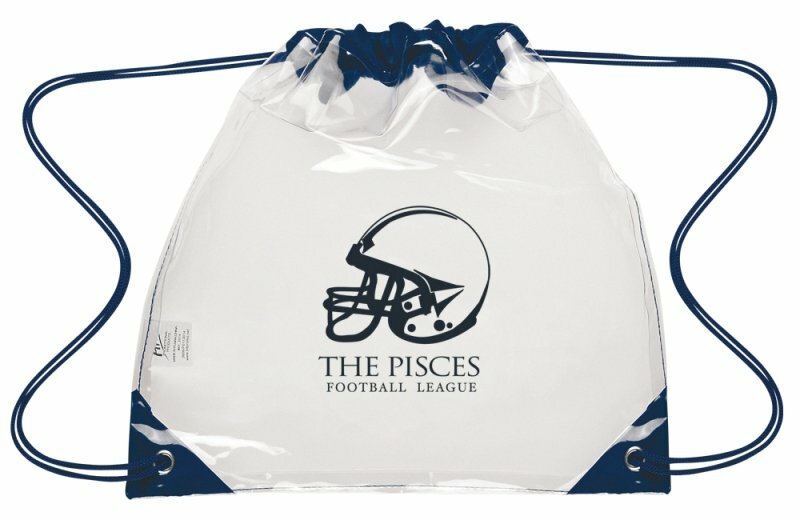 Make life and security easier with a Clear Stadium Drawstring Backpack for sporting events. Applications do include academies, schools, colleges, universities and many pro sports. NFL guidelines state an acceptable backpack or bag size at 12 w x 12 h and CLEAR. NFL guidelines state a maximum of a 3.4 w x 4.5 h imprint for use at their game. Features are heavy duty clear PVC construction, grommets, and drawstrings. The packs are water resistant, meet CPSIA and Prop65 metals guidelines. Overall size of the Clear Stadium Drawstring Backpack is 12" w x 12" h.
Usual and normal delivery from date of an order is 3 weeks. Price includes a one color imprint only, on one side in an area up to 3.4" w x 4.5" h.
Check your local or national stadium guidelines for logo or size requirements. Factory setup charge is $50. Reorders incur a $25 re-setup charge. Logo requires an Illustrator or In Design ai, eps or pdf art file.